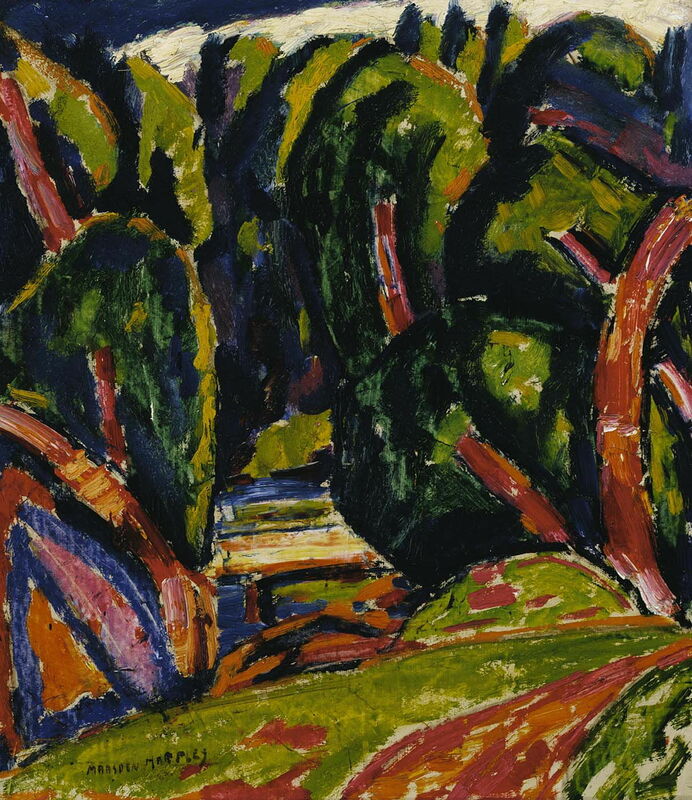 I’ll admit that I was put off Marsden Hartley (1877–1943) by his early abstracts, but a little further research showed that he actually painted many landscapes, particularly later in his career. In this article and the next, I will concentrate on those more representational works. Born Edmund Hartley, in Lewiston, Maine, his family moved to Ohio, leaving him behind to work in a shoe factory for a year, before he joined them in 1892. He then started training at the Cleveland Institute of Art, and won a scholarship to the Cleveland School of Art. In 1898, he moved to study painting at the New York School of Art, where he was taught by William Merritt Chase. From there he went on to the National Academy of Design. 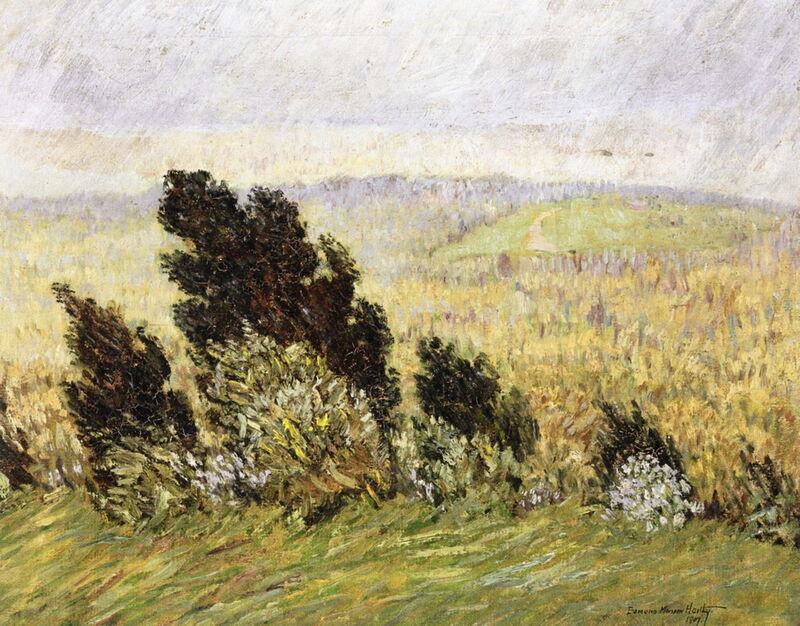 Marsden Hartley (1877–1943), The Cedar Hedge, Chestnut Hill, Boston, Massachusetts (Spring Breezes and Rains, Chestnut Hill, Boston Massachusetts) (1907), oil on canvas, 40.6 x 51.4 cm, Private collection. The Athenaeum. Few of his early paintings are now accessible, but hisThe Cedar Hedge, Chestnut Hill, Boston, Massachusetts (Spring Breezes and Rains) (1907) shows him to have been influenced by Chase and Impressionism. At this time, he signed himself ‘Edmund Marsden Hartley’. Although he had first moved back to Lewiston, Maine, by the time that he painted this in the winter of 1907, he had moved on to Boston. In 1908, he moved from Boston to an empty farm near Lovell, Maine, and considered that his work was reaching maturity – something that he marked by assuming the name of ‘Marsden Hartley’. By then his landscapes, like Carnival of Autumn (1908), were highly chromatic and markedly Divisionist. 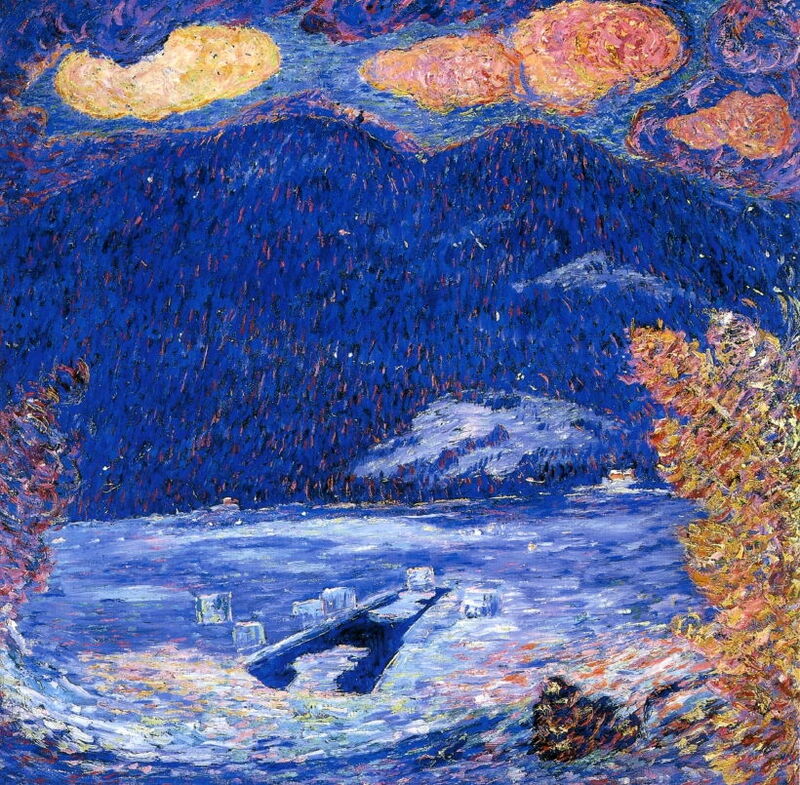 Marsden Hartley (1877–1943), The Ice Hole (1908), oil on canvas, 86.4 × 86.4 cm, New Orleans Museum of Art, New Orleans, LA. Wikimedia Commons. Paintings such as The Ice Hole (1908), showing the harsh winters in Maine, impressed the photographer and art promoter Alfred Stieglitz, who introduced Hartley to the works of Cézanne, Picasso, and Matisse, and arranged a solo show at Stieglitz’s gallery in 1909. 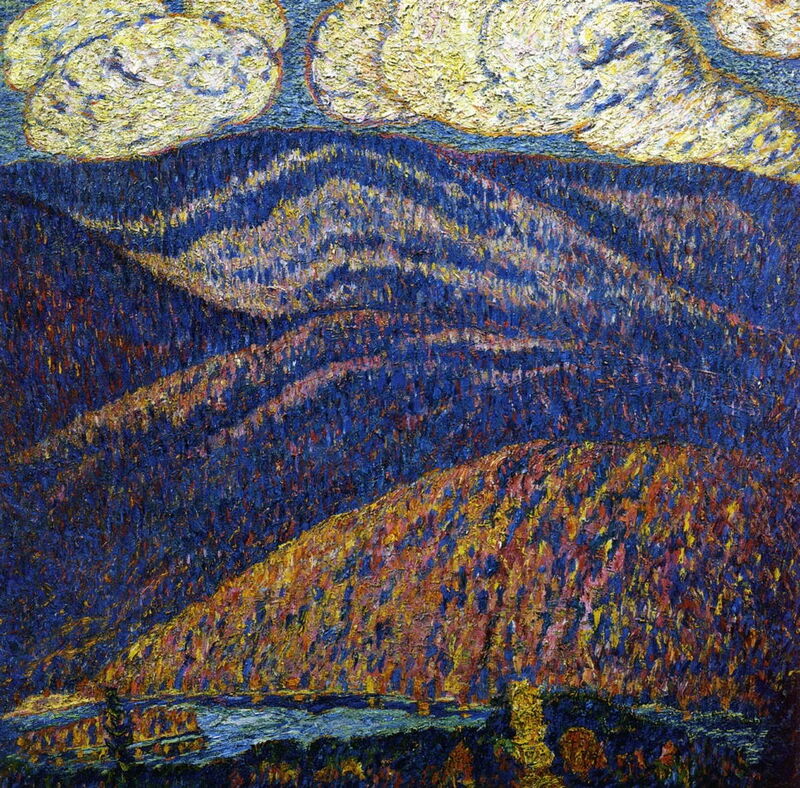 Marsden Hartley (1877–1943), Hall of the Mountain King (1909), oil on canvas, 76.2 × 76.2 cm, Crystal Bridges Museum of American Art, Bentonville, AR. Wikimedia Commons. Hall of the Mountain King (1909) shows the rugged hills of Stoneham Valley, Maine, and the influence of the Swiss painter Giovanni Segantini (1858-1899), who in his later career used stitch-like strokes in keeping with a Divisionist style. The title refers, of course, to Edvard Grieg’s music written for Ibsen’s play, Peer Gynt. 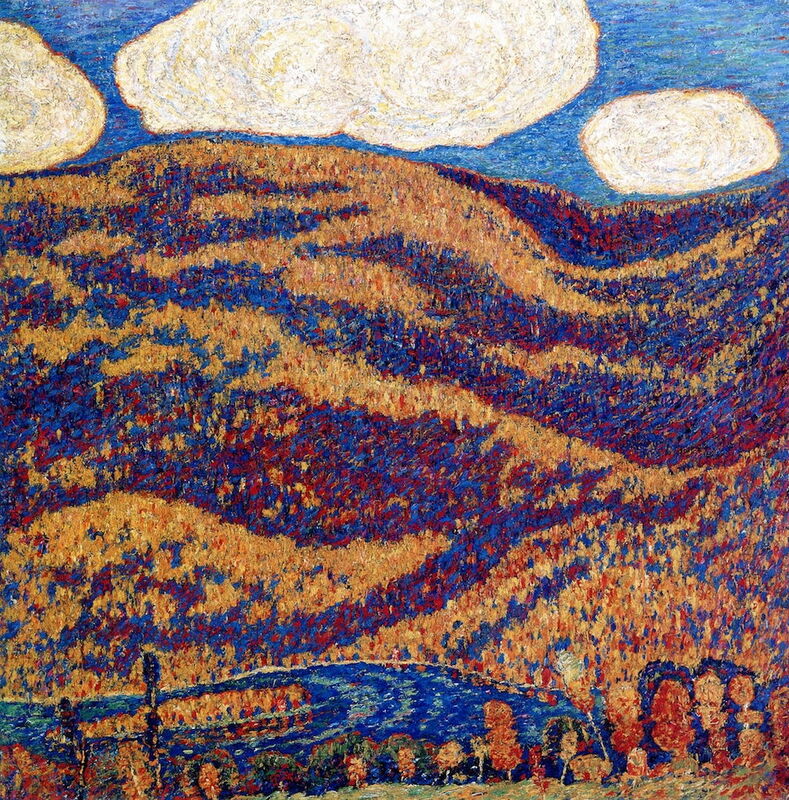 Marsden Hartley (1877–1943), Mountain Lake – Autumn (c 1910), oil on cardboard, 30.5 × 30.5 cm, The Phillips Collection, Washington, DC. Wikimedia Commons. 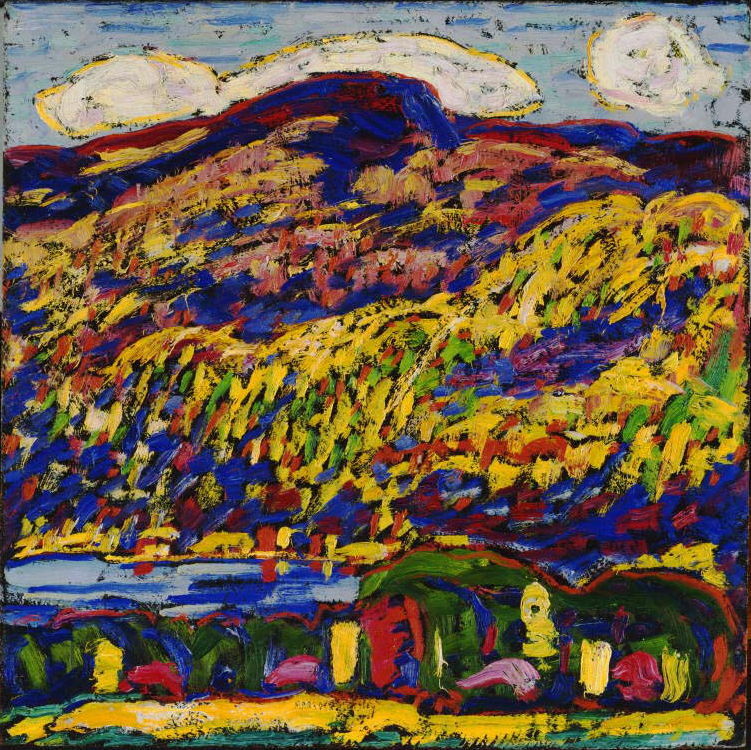 Hartley’s colours became even more vibrant, and his brushstrokes even more prominent, as in his Mountain Lake – Autumn (c 1910). The artist gave this painting to Rockwell Kent in 1912, to whom it is inscribed. Marsden Hartley (1877–1943), Red Tree (1910), oil on fiberboard, 35.6 × 30.2 cm, Smithsonian American Art Museum, Washington, DC. Wikimedia Commons. His Red Tree (1910) was painted when he spent the summer in North Lovell, Maine. In April 1912, Hartley travelled to Europe, where he joined Gertrude Stein’s avant garde circle in Paris. The following year he moved to Berlin, where he got to know Wassily Kandinsky, and collected folk art from Bavaria. 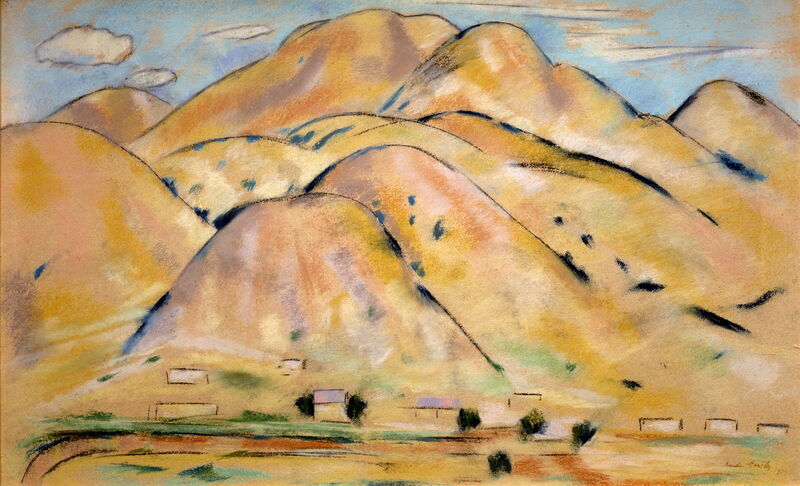 Marsden Hartley (1877–1943), Painting No. 48 (c 1913), oil on canvas, 119.9 × 119.9 cm, Brooklyn Museum, New York, NY. Wikimedia Commons. His paintings then became completely abstract, as shown in Painting No. 48 (c 1913). 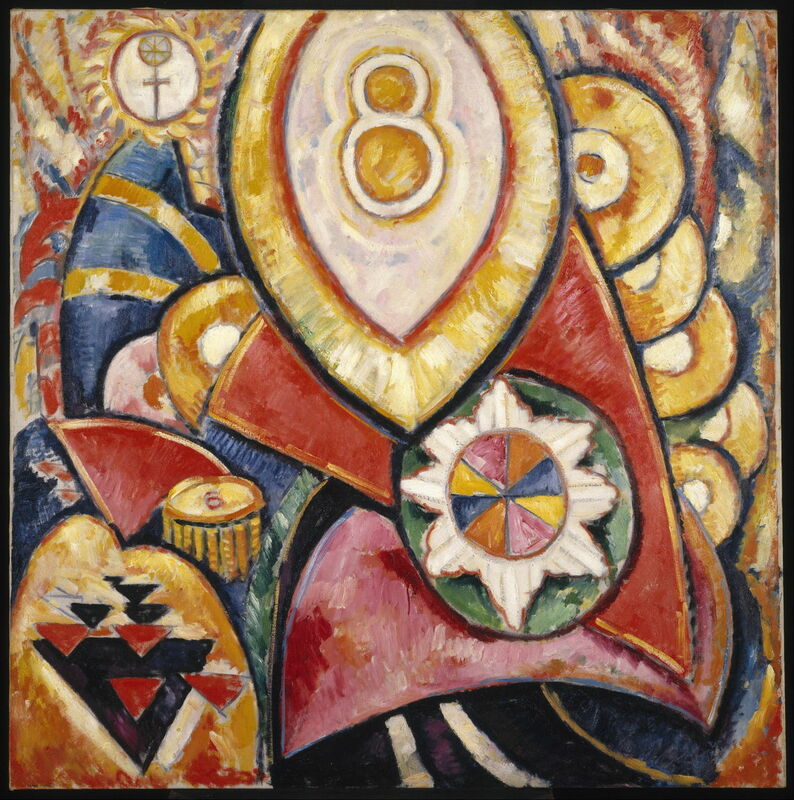 Hartley explained that this work represented the mystical embodiment of the number eight, often associated with transcendence from the material to the spiritual. However, this painting has also commonly been associated with quite different themes, including military insignias and brass bands. Some of these abstracts were included in the (in)famous Armory Show held that year in New York. 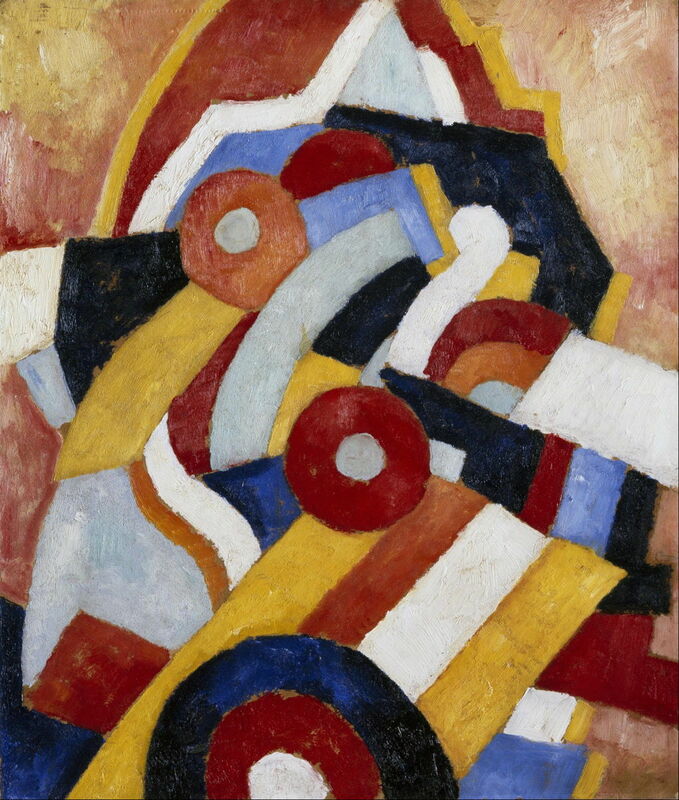 Marsden Hartley (1877–1943), Abstraction (c 1914), oil on paperboard, mounted on panel, 62.2 x 50.8 cm, Museum of Fine Arts, Houston, TX. Wikimedia Commons. Abstraction (c 1914) shows his further explorations of colour and form undertaken in Berlin, just at the outbreak of the First World War. Most of his abstracts from this period are assumed to contain coded expressions of Hartley’s life in Berlin’s homosexual culture, with its strong military associations. 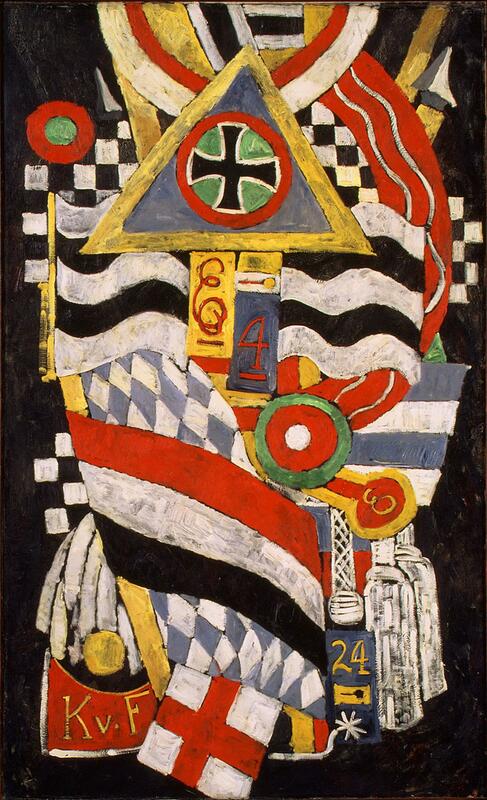 Marsden Hartley (1877–1943), Portrait of a German Officer (1914), oil on canvas, 173.4 × 105.1 cm, Metropolitan Museum of Art, New York, NY. Wikimedia Commons. He had an intense relationship with a friend’s cousin, an officer in the Prussian cavalry, expressed in his Portrait of a German Officer (1914). Lieutenant Karl von Freyburg was killed during the war, which had a great emotional impact on Hartley. 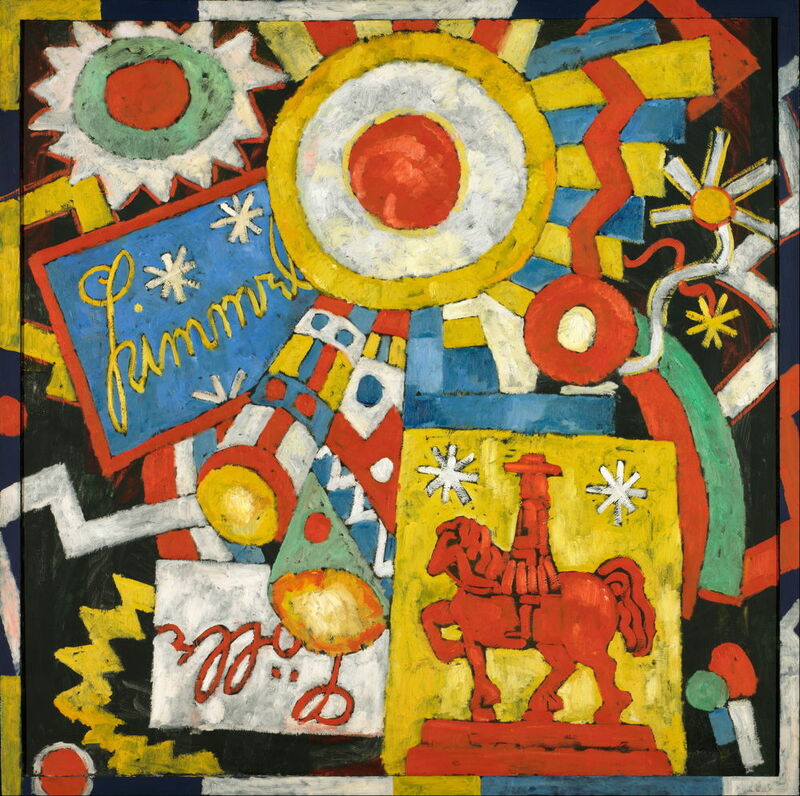 Marsden Hartley (1877–1943), Himmel (Sky) (c 1914-15), oil on canvas, 120 x 120.3 cm, Nelson-Atkins Museum of Art, Kansas City, MO. Wikimedia Commons. Himmel (Sky) (c 1914-15) is apparently a portrait of Berlin in wartime, incorporating images reflecting aspects of city life. Disks of colour are from military uniforms, the conical shapes from candy bags popular among children, and the artist includes the words himmel (heaven) and hölle (hell). 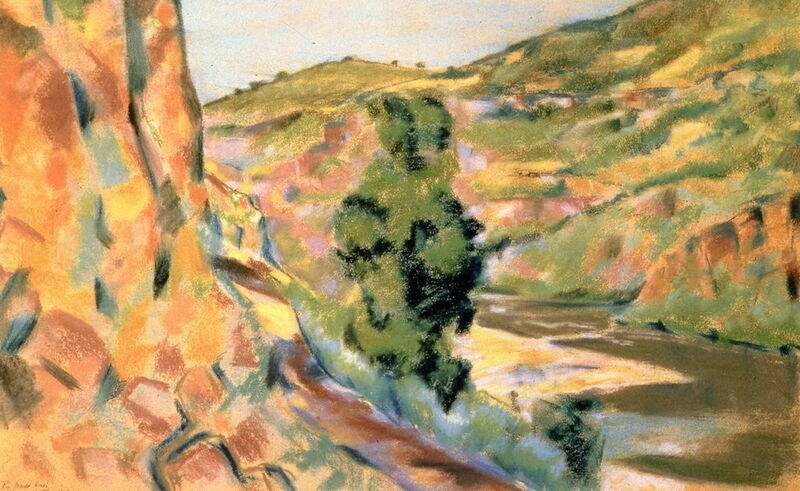 Rio Grande River (1918) is another pastel from his New Mexico campaign. He returned to Europe in 1921, where I will pick up his story in the next article. Posted in General, Painting and tagged Chase, Divisionism, Hartley, Kandinsky, Post-impressionism, Segantini, Stieglitz. Bookmark the permalink.